Clara Driscoll is not a name that most of us would recognise. 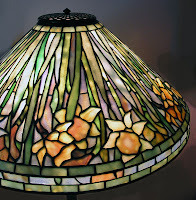 Talk about Tiffany's and their lamps we would likely be much more familiar, and yet the two have now been inextricably linked through the discovery of some letters from Driscoll. Vreeland has taken what little we know about Clara and shaped a story that is filled with fascinating details about not only Clara but also about glass-making, selection of colours and the creation of many beautiful objects of art. 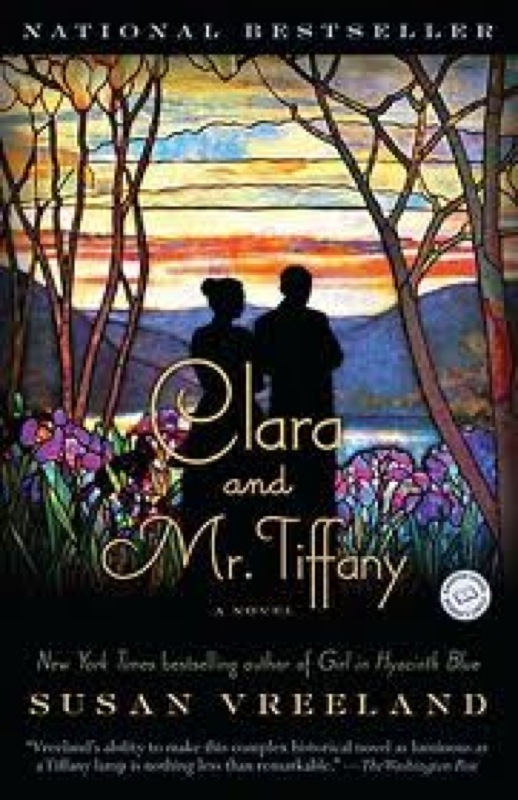 Clara is the central character in this book which is not only about how the iconic lamps came into being, but also about life in New York at the turn of the century and social change. There are plenty of historic milestones that are touched on, including the first time that the ball dropped at Times Square on New Year's Eve, the building of the Flatiron Building and the opening of the underground train systems amongst others. 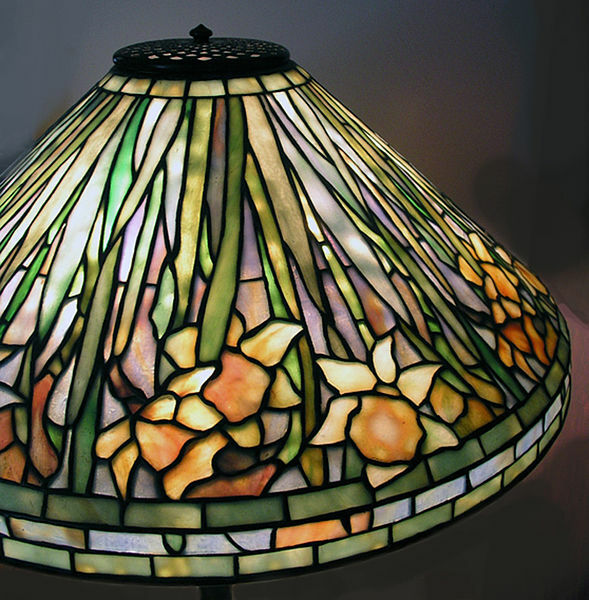 The book opens with the recently widowed Clara Driscoll returning to work for Louis Comfort Tiffany. She had worked for him previously, but he has a very strict policy that none of the women that work for him can be married, no matter who they are, what role they perform - no exceptions. Whilst Clara chafes a little at the injustice of this rule, she is aware that very few of the other glass makers actually employ women at all, and she is so relieved to be back at work, she is prepared to work under those restrictions. Gradually Clara is able to pick and choose the girls who will make up her team, many of them young immigrant girls, and they are set to work on many of the challenging designs that Mr Tiffany wants whether to fulfil orders for customers or for the various big exhibitions including the Chicago World Fair. 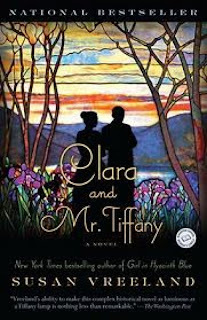 Along the journey, Mr Tiffany encourages Clara in many of her designs, despite the impediments that many of the money men of the company put in her way. What he doesn't do though, is openly acknowledge his designers, not only Clara, but the others as well. This lack of recognition is something that she struggles with because whilst she does want that, she also loves her job, loves designing, and loves the process of making the complicated glass pieces. There are also challenges with the men who work for Mr Tiffany. The women are not allowed to join the union, and there are times when the men seek to stop the women from "taking their jobs". Outside of work, Clara lives in a share house with many other artistic types and so we get a glimpse inside the lives of these people. Through them, she meets the men who shape her personal life. There is Edwin who will in time become her fiance as well as Bernard who plays an important role in her life. All the time though, the men in her life have to compete with her passion for her work. There are times at the beginning of the book where the technical details of the production is a bit overwhelming, but once you get past that initial part, the story just flows. This isn't the first Vreeland I have read, and like the others, the author shows considerable skill in bringing the colours and images to life within the text. "The butterflies, the fish and the dragonflies. Stunning, Clara. Your lamps will last through the ages, and will come to be valued as treasures from our time, worth far more than you can imagine now. I know this. I'm an importer." Hearing that, I felt my spirit soar. I didn't breathe until his velvet voice came through the semidarkness again. "Someday, when women are considered equal to men, it will become known that a woman of great importance created those lamps. This isn't the Middle Ages, Clara. You will not be lost to history like the makes of those medieval windows in Gloucester are. Someone will find you." In the author note, Vreeland talks about the exhibition that she went to see that inspired her to write about Clara. You can't help but feel that this book is another step in finding Clara Driscoll. Edited to add: We are giving away a copy of this book! Head over to read Susan Vreeland's guest post and comment for your chance to win! I just picked up this book a couple of days ago. Excited to dig in. Your review made me even more excited. Cathleen, I hope you really enjoy the book when you do get to read it. I haven't read Vreeland in ages. One day I will read more by her. I have really enjoyed everything I have read by Vreeland so I am not sure why she is not more on my reading radar. This sounds like something I need to put on my TBR pile asap! I haven't listened to an audio book for the longest time! I fell in love with this story...I'm glad you did too! Jennie, have you read any of her other books? I have really liked them all so far. Another book to add to my wish list. The cover drew me in and your description made me want to read it. Both the covers for the hardback and the paperback are absolutely gorgeous!